A new instrument can be a serious investment of money, and probably not one you want to make when you're starting out, especially if it's for your child. Some places will rent instruments, which is one option. But you can also buy secondhand from any number of sources. There are things you need to check on all stringed instruments. Look at the join of the neck and the body. Is it good? Does it look like it's ever been repaired? Is the body in good shape, with the top, back and sides all joined well and without cracks? How is the action: the amount of pressure your finger has to exert to push the string to the fingerboard? If there's been any damage, don't purchase it, you'll only be buying trouble. For violins, violas and cellos, look at the bridge. It might seem like a small piece of wood, but a lot depends on it and they can be devilishly expensive to replace. Tighten the strings to playing pitch and make sure it's solid. Check the fine tuners too, and make sure they work properly. 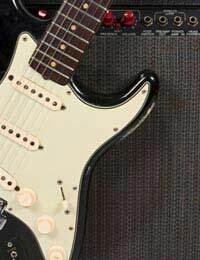 With a guitar, check the machine heads, do they turn smoothly and will the instrument stay in tune? Is the neck straight? The last thing you need is a warped neck if you're starting out on guitar. If possible, bring your own mouthpiece, if you own one and for reeds, your own reeds. Check the condition of the keys, do they move smoothly and go back without any play in the hinge? Obviously the instrument should be in reasonable, playable condition, but be sure to check the pads under the keys. If they seem excessively worn, don't buy the instrument! A new set costs a great deal of money, possibly more than you'll pay for the instrument itself. Make sure the mouthpieces and reeds fit securely. Where you can, take the instrument apart and reassemble it to ensure everything fits tightly and easily. There's a wealth of percussion instruments, ranging from the lowly triangle to kettle drums, drum kits, cymbals, gongs and hand drums. Assembling a collection can be time consuming and drain a big chunk out of your wallet. You need to be sure the skins on drums are taut, and that the bodies aren't cracked in any way, and the cymbals should give a true sound. Truthfully though, there's less that can go wrong with older percussion instruments than most. Even secondhand, it's unlikely you'll find a good, cheap piano. The first thing to consider, even before you look, is the amount of space you have. That baby grand might sound like a good idea, but can you even get it in the living room? Chances are you'll have to settle for an upright. But even then, check your doors first and take a tape measure to be certain it'll fit. Try all the keys to make sure they work, then open it up and look inside. How's the felt on the hammers? Is the soundboard sturdy? Is it in tune? If not, you'll have the extra expense of bringing in a tuner and will have to hope that it can actually be tuned. Buy an instrument that's in tune and save yourself some possible headaches later.